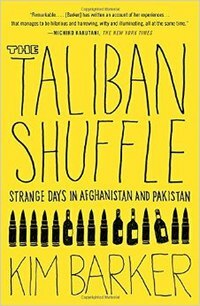 The Taliban Shuffle: Strange Days in Afghanistan and Pakistan is a memoir by U.S. journalist Kim Barker about her experiences reporting in Pakistan and Afghanistan. It was published in 2011. The book has received mostly positive reviews. The book has received 3.42/5 ratings on Goodreads based on 2,560 reviews. BookBrowse rated the book 4/5. In February 2014, U.S. actress Tina Fey confirmed that her production company, Little Stranger, would be adapting the book into a film, which was released in March 2016. Fey stars in the film, which was produced by Lorne Michaels and written by Robert Carlock. Paramount hired Glenn Ficarra and John Requa to direct the film. It co-stars Margot Robbie, Martin Freeman, Billy Bob Thornton, and Alfred Molina. ^ a b "Tina Fey To Star In Middle East War Comedy 'The Taliban Shuffle'". The Huffington Post. February 20, 2014. Retrieved February 20, 2014. ^ Kakutani, Michiko (March 14, 2011). "Battle-Zone Absurdity and Adrenaline-Fueled Folly". The New York Times. Retrieved February 20, 2014. ^ "The Taliban Shuffle: Strange Days in Afghanistan and Pakistan". Retrieved 22 June 2016. ^ "The Taliban Shuffle". 22 June 2016. ^ Sneider, Jeff (June 30, 2014). "'Crazy, Stupid, Love' Directors Will Do the 'Taliban Shuffle' With Tina Fey". thewrap.com. Retrieved July 2, 2014. ^ "Billy Bob Thornton and Alfred Molina Join Tina Fey's Untitled Comedy". This article about a book on journalism is a stub. You can help Wikipedia by expanding it. This page was last edited on 24 February 2019, at 02:57 (UTC).